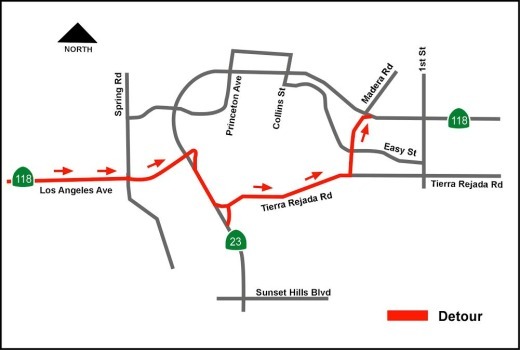 The California Department of Transportation (Caltrans) will close the northbound Moorpark Freeway (SR-23) connector to the eastbound Ronald Reagan Freeway (SR-118) at Los Angeles Avenue from 10 p.m. Friday, February 7 until 5 a.m. Monday, February 10. The closure is required to implement emergency repairs of bridge joints on the Arroyo Simi Overhead structure. Electronic freeway message signs will begin warning of the impending closure a week in advance. Caltrans is urging motorists to avoid the interchange if at all possible and to expect delays. Eastbound SR-118 will be directed to exit northbound SR-23 at Tierra Rejada Road, travel eastbound and then turn left onto Madera Road to return to eastbound SR-118. Motorists continuing on eastbound SR-118 from eastbound SR-118/Los Angeles Avenue will take southbound SR-23 to Tierra Rejada Road. Work will take place around the clock and may generate noise and dust for residents adjacent to the freeway. Otherwise, the work is not expected to involve significant community impacts. A second 55-hour closure will be required to perform the same work on the westbound Sr-118 connector to southbound SR-23, currently scheduled from 10 p.m. Friday, February 21 through 5 a.m. Monday, February 24. Additional information will be provided closer to that date.